Koert van Mensvoort gives the introduction and he starts by explaining what makes the endeavor of a powerpoint cinema experiment worthwhile. The amount of powerpoint users is approximately 300 million. 30 million presentations are given via this piece of software every day (! ), of which at least 50% is totally unbearable. 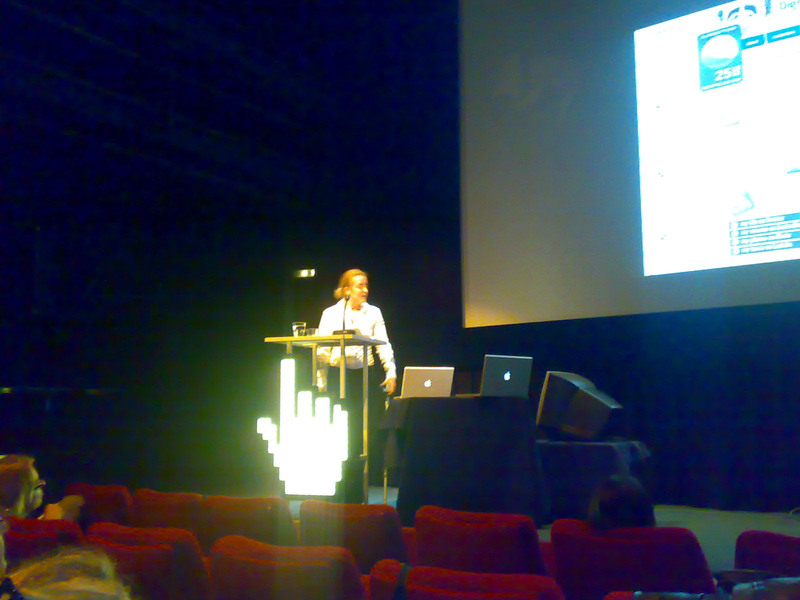 A clip is shown by a famous comedian Don McMillan: he shows all the cliche uses of powerpoint thus how NOT to use it. The question raised by Koert is if Powerpoint can be used in a positive way? An example is shown in the form of the famous “inconvenient truth” Powerpoint by Al Gore. The funny thing is that he received a Nobel price with a powerpoint presentation. The question here is: can you make cinema with Powerpoint? Koert shows that this has been done before y showing the movie ” sea of possibilities” (look it up!) a very old powerpoint movie, made by the lead singer of the Talking Heads, David Byrne (very experimental, too). The larger issue to cover is: can powerpoint be a tool for cinematic production? With everybody having access to cinematic software, who are the new filmmakers now? Within this democratization of media, what is happening? The first keynote speaker is the guru, if you will, of reflecting on our media society. Currently a visionary in residence at the Sandberg Institute, Sterling starts by saying he has no powerpoint (he is a novelist!). His talk will be about the importance of Lev Manovich (for whom he lectures in his place here today) to him. Manovich would not use the word new media (it is old already)- also he is a modest man. Critical software studies is the new thing amongst new media gossip in the California new media circle. Go find it on Google video. Lev is everything – a kind of homo universalis. He talks a lot about Russian constructivism, montage and collage. 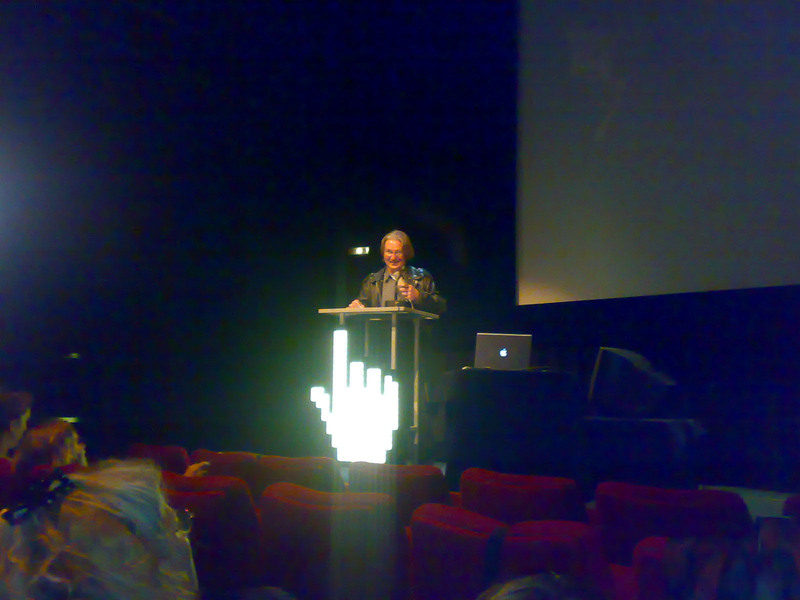 And about dead media, which is also a pre- cinematic hardware project by Bruce Sterling. back to the topic; how to make cinema with powerpoint. The main point to make is about hybrid tools and the compositor. The new way of production. The language of new media, by Manovich is a book that describes these issues amazingly to-the-point. And it is still avant-garde. Lev also wrote a book about also, infosthetics. Infosthetics bothers Bruce. Compositors are digital methods to add special effects – a sort of after effects for analogue film. These effect- devices overthrew analogue media. This originally happened with text. New/hybrid/meta media are terms used. What is the difference in these tools? It is the numerical representation, modulation, its trans-codedness and so on. Typical of a tech-revolution (a velvet one) is that a technique imitates the status quo, but with add-ons – new possibilities. The new treats the old the same but then with new options. In this case, making cinema has now cut itself loose from physical limitations. It is just manipulating pixels. This also brings a total different set of social tools for this data. We still call a picture taken by a digital camera a photograph, but it is not anymore. Physical strip becomes a digital loop. It turns a 2d vision in a 3d space with new options. This paradigm shift had its intro in text and typography. After that, it saturated in other and more types of media (animation, effects, and so on). About Lev and databases: he is a programmer. You the new filmmaker red.) need to understand databases in order to create tools. Manovich also started this endeavor by creating “Soft cinema” experiments within cinema. These were all about experimenting with the compositor role within cinema. Unfortunately, these are theoretically interesting but painfully to watch. Within this context, powerpoint is a primitive compositor. Where all media are becoming digital, the computer has replaced all other; it is the food processor of new media. It is a hybrid metamedium that acts as a cook. Also being able to run parallel sessions, different media. We do not know the difference anymore. There is no information overload, I am just a user, a power user. Sterling points out the discussion between Jenkins and Manovich. Convergence culture (Jenkins) and the Velvet revolution (Manovich) are two stories of the same cultural event, if you will. Lev says users are not interesting. Jenkins says they are the core. The problem of the digital is that it is temporal. Film, for instance, is an archival medium, due to the real and analogue chemical process of putting something on a filmstrip. As a working medium however, it is dead. 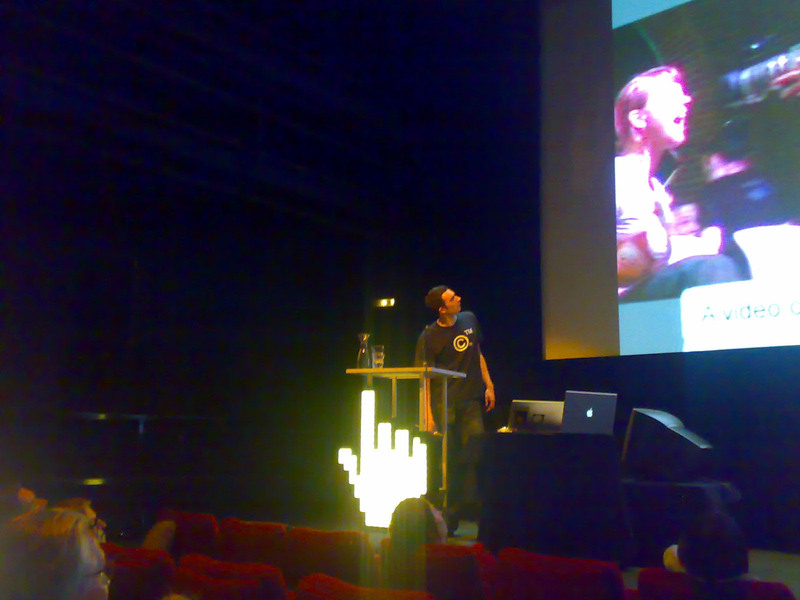 The new media are tools to create pixels and sound and have replaced traditional cinema in terms of tools. Why would one make powerpoint cinema? When you make things very difficult, by setting certain constraints, this case the use of powerpoint to make cinema, something good is bound to come out of it, just because of these constraints. Also the formal constraints help you lose focus, forget why you actually started on the project in the first place: a sort of Zen-practice. Sterling is a metamedium guy – people make search engines, os-es, or webdesigners, or user exp. people, or video gamers and so on are close to cinemators. Show ends with the statemnet that this was a nice Meta-Manovich performance. q: Tell us more about the velvet revolution. a: Although people are not killed (explains the velvet) it still was a clear revolution. The hard edges of what once was a velvet revolution are becoming clear now via – amongst others- copyright discussions and a trend of formalizing the Web. New forms of ‘stuff’, like computing into the physical world are new areas, where we do not have a relevant method/ framework for discussing. q: What should you do as a moviemaker these days? a: You should redefine yourself: how much of what you do is cinematic? How much of that can be moved into the digital? What you do is leaking all over the screen. Maybe you should reinvest you energy and efforts in other fields. The next enterprise in cinema with be huge, but in different ways. Not as a movie, but as a national holiday. it is becoming ways too large in many different methods/ways: a carefully global calculated enterprise. Keywords of his talk are: event-driven video editing, live editing, sampling. Nowadays he is doing exactly thesame thing, but in a more easy way. Now, new tools are available. He used to be working with analogue video editing: a process of three month for a very small video. He is still interested in creating funky, new, creative stuff. When more powerful tools were emerging, Eboman developed his own software and hardware. To play with video in real-time was very difficult in the end of 90ties; since 2002, computers are fast enough to process real-time video, and store lots of video data. The development of the instrument has taken a lift-off. Now he shows the instrument. It is called Sense IV. It is a sampler. You can use stuff in an event-driven manner. Also it supports real-time graphic motion design, which is used a lot in advertisement industry or trailers. Now shows a performance (I like the live-video scratching bodysuit!) See www.eboman.info. For more…. info. In the performance, he is wearing a bodysuit that is connected to the SenS IV sampler and he is accompanied with a drummer who is also connected to SenS IV. Together they can record, edit, mix, manipulate and distort audiovisual samples and graphics in realtime in a virtual 3D space. Where normal tools are batch-driven, this is event-driven, which is so much more live and vivid. Every element and step within the process is real-time. Makes it possible for users to work way more efficient. He continues by explaining that the market of audiovisual media has exploded and the facilities to produce are way more accessible. A result thereof is that video becomes disposable. Also, because the video posted by a user loses relevance within a day; it becomes temporal. As a video produces, you don’t have much time anymore to invest in you project, That’s why Eboman chose for the most fast way of producing video: REALTIME. (and event-driven, which I think is a very smart thing to do). He does not work with linear video, but rather with templates (prefabbed). In order to give an idea, the Sense software looks a bit like a combination of GuitarBand and FinalCut pro (put bluntly). You load in a midi file and let that trigger sample movies. Eboman shows a movie done for Fortis. The reactions to the movie made (a commercial) were overwhelming, but the only thing he did was download ready-made movies and a midi-file (if you are working at Fortis, please consider the former as bullocks). (you should see the movie here ). The great thing however is that the same process can be done live, with the audience. Here we see an advanced use of templates: he is also adding audiovisual 3d effects. Programmed in the studio, performed live by replacing the original stuff with the now-recorded audience content. (shows the performance on a festival). Data is much more facilitated on the web. We need the right tools deal with these possibilities properly. Koert: the content a certain tribal quality. Eboman: I cannot wait until the next step in tools. I see sampling as a genre, as a medium. Eboman votes for the remixing culture – it triggers you as an artist to stay sharp and to be creative every day. I am a non-linear, modular guy. Anne Helmond – blogging, software standards and template culture. Anne is a lecturer at the University of Amsterdam and a blogger. Within her thesis, she writes about ‘blogging for engines” in this talks, she introduces the notion of software studies and (possible?) underlying sub-fields of this new area of study. She is actively involved in the software studies-initiative by Lev Manovich. The question to answer is how do we establish a new field of study that is about software. And, is there such a thing as a language of media; does this lead to new aesthetics and different languages of media. This should change the way we think about our culture, where software has penetrated our society (I would use permeated). Manovich described convincingly in his book ‘the language of new media’ that there indeed is a language to be found in new media. From media studies we should move to software studies. The kind of software studies Lev does is the “million dollar ‘ version of software studies, which unfortunately is not possible at the University of Amsterdam. But there are other ways. The main point is that software has become a cultural force. As a result, this force is an object of critique, and should at least be studied. One part of software studies is that of the template culture. The template culture is visible in popular cms (content management systems red.) like Joomla and the popular blog software WordPress. It is all about default settings, templates and themes. Within WordPress, there are millions of choices in templates; still they all look the same. Template culture define a cultural software – defined by medium and practices, in this case blogging. Blog software enabled easy publishing. One-button publishing software. Blogging used to be the domain of geeks, nowadays blogging promises some democratic level. If you really want to be different, you will have to change the code. Anne shows a Unix-interface blog example to show that a blog is just a database and one WordPress user treated his blog as such. (Anne thinks this is beautiful I say it is very geeky). The point to make here is that blogs are interfaces for databases. Not everyone is a hacker, so what should this software study look like? Most of us who use and study media culture are not hackers, but more like a part of a template culture. Anne continues by talking about the widgetized self. Widgets are a popular way of personalizing your blog using third party (social) software. Widgets are the individualization of the template culture. Also, the website you refer to to that funny Obama- mccain movie is not working, I can’t find it anywhere, can you tell me where to watch? thanks! @ dorris: I can’t find it either (it was way too fast to blog) I’ve asked Eboman if he could help me finding the url… it was way too good to not share. Hope it will pop up soon.